Now I see what I did there ... hah ... well played, sir. For several years JAXA has been talking about a crew vehicle based on HTV, and the return capsule sure looks like development work in that direction. It could give them independent access to ISS, China's station, LOP-G and commercial outposts. Crew aboard the space station are scheduled to receive two cargo resupply missions in the coming days. Tomorrow, launch of Northrop Grumman’s Antares rocket with Cygnus cargo spacecraft bound for the International Space Station is targeted for 4:01 a.m. from Pad 0A of Virginia Space’s Mid-Atlantic Regional Spaceport, located at NASA’s Wallops Flight Facility on Virginia’s Eastern Shore. 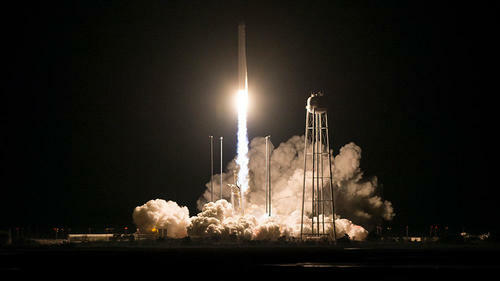 NASA TV will provide launch broadcast coverage online beginning at 3:30 a.m. A Cygnus launch Saturday would result in capture and berthing on Monday, Nov. 19. Video from the onboard camera of the Soyuz-FG launch vehicle, which on November 16 withdrew a cargo ship into orbit on #ПрогрессМС10 🚀 November 18, the space truck successfully docked to the ISS! 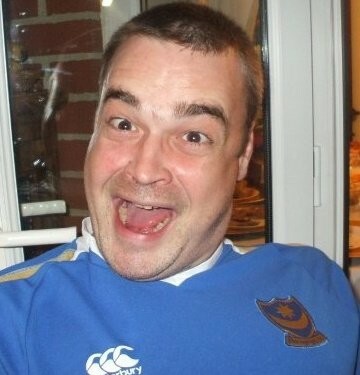 This one is a treat. 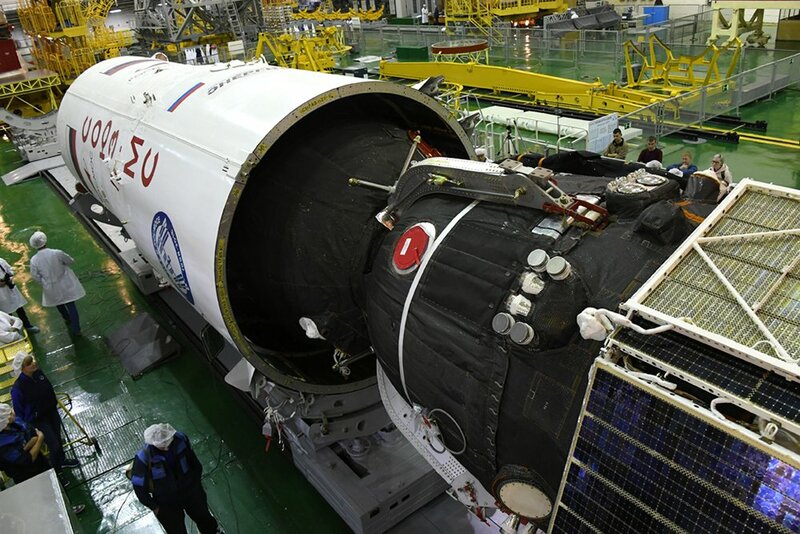 Not often that we get to see boosters attached to a Soyuz (MS launch)...here is MS-11 being assembled. This is definitely due to the last incident...a show of careful ops and precision...as it should be. Japan's space agency, JAXA, has showcased a capsule that returned from the International Space Station and announced that its technology basically works. On Tuesday, the Japan Aerospace Exploration Agency showed the capsule to media for the first time at its facility in Tsukuba City, north of Tokyo. The cone-shaped capsule, with an 80-centimeter diameter bottom, was shown to the media disassembled. A parachute used to land it on the ocean and a container that features thermos bottle technology were also put on display. The recovery capsule containing protein for medical research returned to Earth, in a first for Japan. 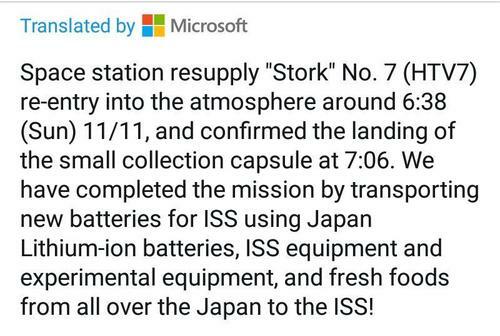 It landed in the Pacific Ocean on November 11. 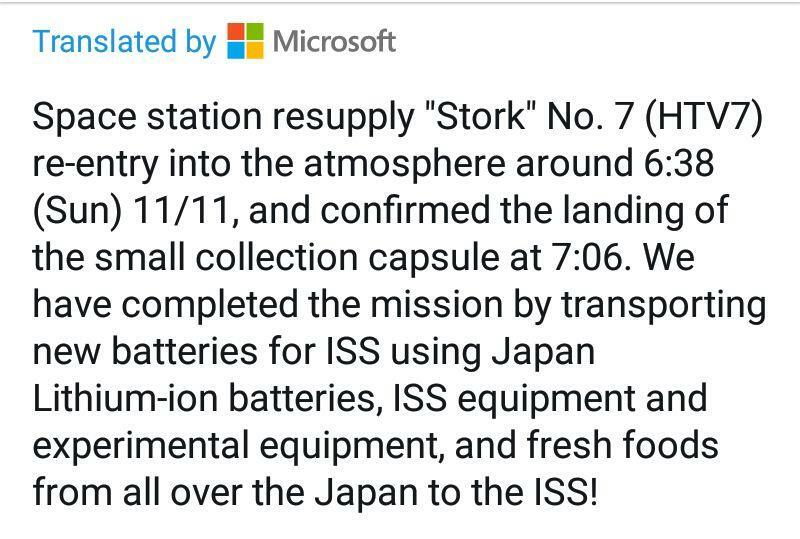 It detached from the Kounotori 7 transfer vehicle, which had undocked from the ISS. The capsule reentered Earth's atmosphere and was exposed to temperatures of about 2,000 degrees Celsius. JAXA officials say the temperature inside the container was kept as designed, at about 4 degrees Celsius. The officials also say they have confirmed through microscopic observations that the protein crystalized at the space station has retained its crystal state and can be used in future experiments. Currently, only the US and Russia have capsule recovery technology. The mission is attracting attention in Japan as it could pave the way for the country's manned space exploration in the future. JAXA project leader Kota Tanabe gave full marks to Japan's first capsule recovery. He said his team wants to develop a system to bring a capsule back to Earth without a cargo spacecraft like Kounotori. Ahhhh ... You're right. Smile upon my face. Dragon and Cygnus have proven to be very wise investments. Issue with the TDRS. 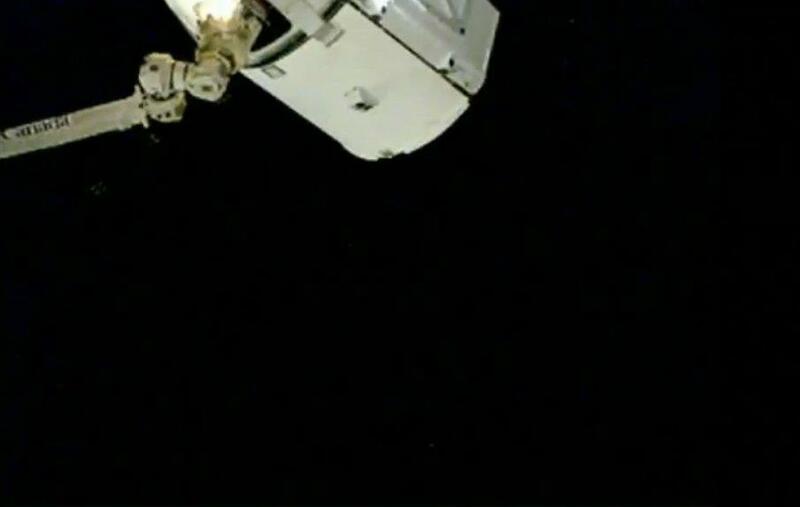 Moving the Dragon to 30m holding position until the next one comes into range. For the love of ... it was literally ten meters from the Canada Arm, in the grapple position. NASA. Getting nothing done quickly or easily since 1974. It was right there. Capture confirmed! 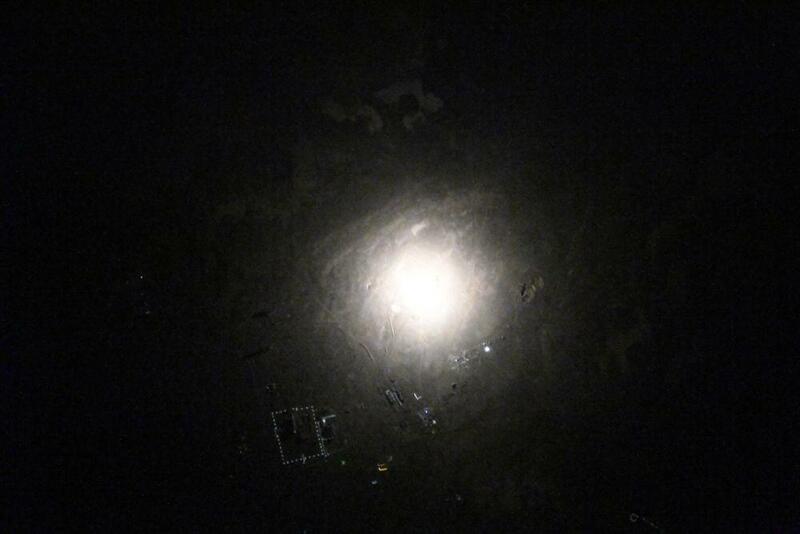 Dragon was captured at 4:21 a.m. PST while flying over Papua New Guinea. 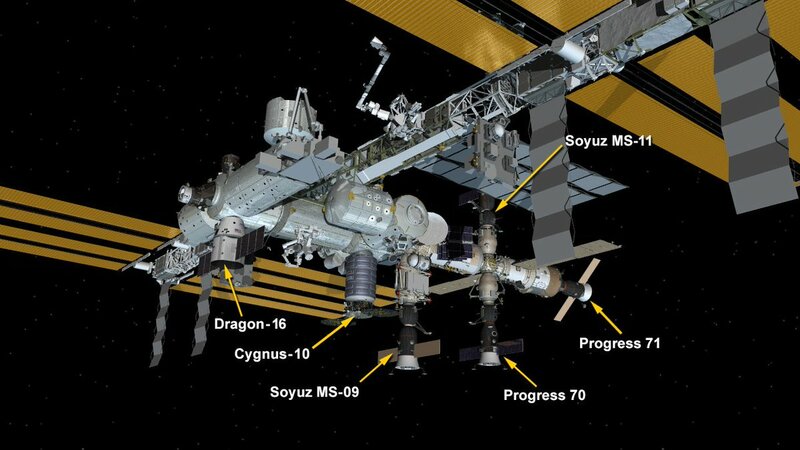 Dragon will spend about five weeks at the @Space_Station. RSC Energia specialists developed a special cyclogram of a walk in open space and conducted a training session on Earth. Read more in the story of RSC Energia. Expedition 57 Flight Engineers Oleg Kononenko and Sergey Prokopyev of Roscosmos will use this spacewalk to examine a section of the external hull of the Soyuz MS-09 spacecraft currently docked to the space station. In late August, a pressure leak occurred on the space station that was traced to the Soyuz. Within hours after finding the source of the leak, the Expedition 56 crew sealed the hole and the station has since maintained a steady pressure. Three residents of the International Space Station, including one NASA astronaut, are scheduled to wrap up their stay aboard the orbital laboratory Wednesday, Dec. 19. Live coverage of their return to Earth will air on NASA Television and the agency's website. NASA Flight Engineer Serena Auñón-Chancellor, Expedition 57 Commander Alexander Gerst of ESA (European Space Agency) and Soyuz commander Sergey Prokopyev of the Russian space agency Roscosmos will close the hatch to their Soyuz MS-09 spacecraft and undock from the station's Rassvet module, with a landing scheduled for 12:03 a.m. EST Dec. 20 (11:03 a.m. Kazakhstan time) southeast of the remote town of Dzhezkazgan. The crew is completing a 197-day mission spanning 3,152 orbits of Earth and a journey of 83.3 million miles. Auñón-Chancellor and Prokopyev are completing their first flights into space, while Gerst will be returning from his second long-duration mission. With a total of 362 days in orbit, Gerst will hold the flight duration record among ESA astronauts. 4:40 p.m. – Change of command ceremony with Gerst handing over station command to Oleg Kononenko of Roscosmos. After landing, the crew will return by helicopter to the recovery staging area in southern Kazakhstan, where they will split up to travel to their respective homes. At the time of undocking, Expedition 58 will formally begin aboard the station, with NASA's Anne McClain, David Saint-Jacques of the Canadian Space Agency, and Kononenko comprising a three-person crew for just under three months. The next residents to the space station — Nick Hague and Christina Koch of NASA and Alexey Ovchinin of Roscosmos — will launch aboard Soyuz MS-12 Feb. 28, from the Baikonur Cosmodrome in Kazakhstan, to join Expedition 58 following a six-hour journey. Editor's note: The sixth paragraph was updated to reflect the accurate reasoning for why NASA recognizes Nick Hague as a flown astronaut. Because Hague and Ovchinin launched and landed in a spacecraft on an intended mission to the International Space Station, NASA considers them to have achieved the status of flown astronauts, making this Hague’s second spaceflight and Ovchinin’s third. NASA astronaut Nick Hague, who was forced to abort his recent mission to the International Space Station, is scheduled to launch again Feb. 28, 2019, from the Baikonur Cosmodrome in Kazakhstan. 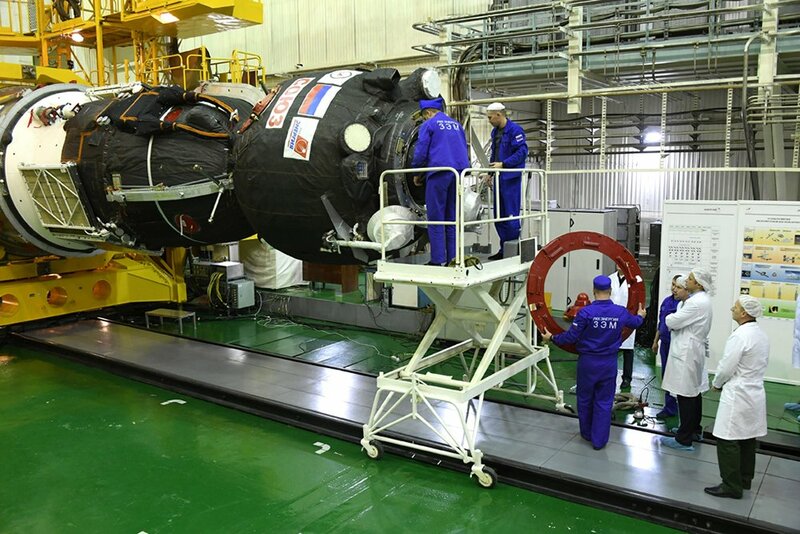 Hague will launch with Alexey Ovchinin of the Russian space agency Roscosmos, who was his commander and crewmate on the aborted mission in October, and NASA astronaut Christina Hammock Koch aboard the Russian Soyuz MS-12 spacecraft. The trio will join the station’s Expedition 59 crew and return to Earth in October 2019 as members of Expedition 60. Hague and Koch will serve as flight engineers for Expeditions 59 and 60. Ovchinin will serve as a flight engineer on Expedition 59 and the commander of Expedition 60. Hague will be available for media interviews at 7 a.m. EST Friday, Dec. 7. To schedule an interview, media must contact Megan Sumner at megan.c.sumner@nasa.gov or 281-483-5111 by noon Thursday, Dec. 4. All three crew members will participate in a news conference at 3 p.m. Wednesday, Dec. 12, at NASA’s Johnson Space Center in Houston. The news conference will air live on NASA TV and the agency’s website. To participate in person, media must contact Johnson’s newsroom at 281-483-5111 by 5 p.m. on Dec. 11 for credentials. To participate by phone, media must contact Johnson’s newsroom by 1:45 p.m. Dec. 12. During their mission, the station crew will take part in about 250 research investigations and technology demonstrations not possible on Earth to advance scientific knowledge of Earth, space, physical, and biological sciences. Science conducted on the space station continues to yield benefits for humanity and will enable future long-duration human and robotic exploration on missions to the Moon and Mars. The crew also is scheduled to be onboard during the first test flights of NASA’s Commercial Crew Program, which will return human spaceflight launches to U.S. soil. 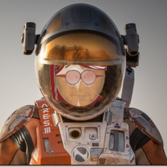 This will be Koch’s first spaceflight. Hague and Ovchinin were scheduled to join the station’s Expedition 57 crew on Oct. 11, but were forced to abort their mission when their Soyuz’s rocket booster experienced a malfunction shortly after launch. Because Hague and Ovchinin launched and landed in a spacecraft on an intended mission to the International Space Station, NASA considers them to have achieved the status of flown astronauts, making this Hague’s second spaceflight and Ovchinin’s third.